The VFL premiership defence is over for Williamstown. And the all-west VFL grand final that footy fans in this neck of the woods had dreamed of for 24 hours is a non-starter. The Seagulls were beaten at their own game, receiving a lesson in hard, physical and disciplined football from the Casey Scorpions in a 42-point preliminary final loss at North Port Oval on Sunday. Williamstown was on the back foot from the outset. The Seagulls conceded the opening four goals of the game to go into quarter-time with a 29-point deficit. On a difficult day for scoring and with intermittent rain falling, it was always going to be tough for the Seagulls to mount a comeback. In true Seagulls fashion, they never went away and turned the game into an arm wrestle. But they could not erode the deficit on the scoreboard, which was always comfortably in the Scorpions’ favour. The Scorpions put a lot of work into limiting the Seagulls’ “big three” midfielders – Liston Trophy winner Michael Gibbons, captain Ben Jolley and Willie Wheeler. Gibbons had a target on his back and was often the recipient of a bit of extra oomph from the Scorpions tackles. Caleb Hislop was another of the Seagull midfielders to be hit with brute force on multiple occasions. That David Fahey and Ben Bese were two of the Seagulls’ best says plenty about the dominance of the Scorpions in key areas of the ground. Fahey and Bese never stopped trying and saved the scoreboard from being a blow out. The grand final loss brought to an end an up and down finals series for Williamstown. The Seagulls started their September campaign with a miserable 46-point loss to Collingwood. They backed that up with a dominant 46-point win over Sandringham and then fizzled out with the heavy loss to the Scorpions. Meanwhile, the Box Hill Hawks took out the AFL Victoria Development League premiership after a 105-point win over Casey Scorpions in the grand final at North Port Oval on Sunday. THE conditions were miserable. It was cold, a biting breeze blew to the Williamstown Rd end of North Port Oval, the ground was heavy with water and in some places thick with mud, and there was on-and-off rain. 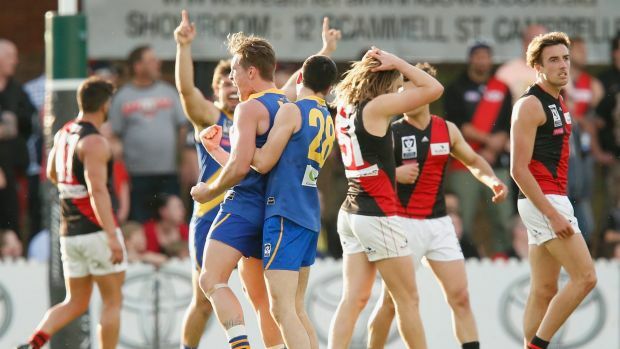 Williamstown won through to their first grand final since 2011 after withstanding a gritty Essendon by 12 points in a pulsating preliminary final at North Port Oval on Sunday. It sets up a tantalising grand final at Etihad Stadium on Sunday against the Box Hill Hawks; the team they lost to in last year's preliminary final — their seventh of the last nine prelimin finals — by seven points. 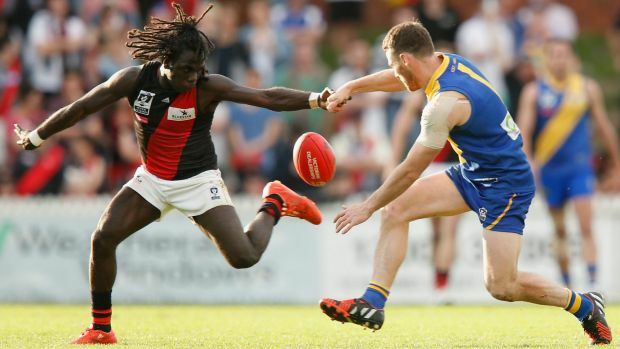 Certainly, the mental demons from that final had returned at three-quarter-time after the Seagulls gave up a 27-point lead from mid-way through the third term to trail the Bomber by five-points. Seagulls coach Andy Collins, who said the win "means everything to the footy club", told his charges at the last change: "You've got to get the ball control back." He threw opportunist goalkicker Sam Dunell and Cameron Lockwood behind the ball and - along with Ben Jolley, who had 14 of his 28 disposals in the final term, and defender Peter Faulks, who controlled the dangerous Kyle Hardingham – the Seagulls, with the week's break, outran the Bombers, winning 15.12 (102) to 12.18 (90). Leigh Masters, a former Bendigo Bomber, kicked the opening two goals of the last term, before goals to Mitch Banner and Sam Critchley sealed the result. Dunell said the week's break — after upsetting Sandringham in the qualifying final — was the difference with their part-time players needing extra time to recuperate. "We knew we had the legs with a week's break, it's just great to see us run over the top," Dunell said..
"We've been planning for it [making a grand final] since October-November... all that hard work. It's just a great feeling," he said. Williamstown, with seven players in this year's VFL team of the year, are the first stand-alone team to make a grand final since Port Melbourne, who beat the Seagulls, in 2011. They will be out to win their first flag since 2003 as Collins coaches against Box Hill, a team he is familiar with, having taken the club to finals in 2004-05 and being a former Hawthorn premiership player. Williamstown continue to be the pace setters in the VFL after upsetting Footscray by 39 points at Whitten Oval on Sunday. Cameron Lockwood's goal at the 10-minute mark of the final term was a fitting blow to celebrate his 100th VFL match in style, but realistically this match should have been over much before that. Perhaps the inaccurate Seagulls flattered the Bulldogs, winning 9.22 (76) to 5.7 (37). Sam Darley (38 disposals) and Lachie Hunter (34) were prolific for the Bulldogs, but the damage was done on the scoreboard as the Seagulls ran rampant with Mitch Banner scoring two opportunist goals, while Andrew Galluci also snared two majors. In a low-scoring affair for the most part – only six goals were scored in the first half – the Seagulls finally broke free early in the final term after leading by just 18 points at the last change. Footscray have been accustomed to playing the game plan that they wanted against most teams so far this season. But two of their losses have been against formidable opponents Box Hill and Williamstown, which have excelled at shutting down the Dogs' running game.